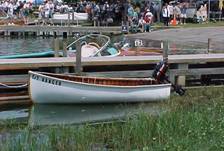 Ranger is a Matthews “38” Single Cabin Stock Cruiser built in Port Clinton Ohio in 1930. She is hull #11262, and was delivered new in 1931 to J.R. Fales of Pawtucket, RI. The Walter H. Moreton Corp. of Boston was the selling agency, and Mr. Fales paid $9,388.25 for the boat delivered, including a number of extras. Originally named Eleanor I, her homeport was Nantucket, MA. She was sold in 1933 to John G. Brown (also of Pawtucket) and renamed Ranger. 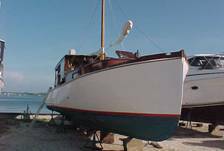 Extensively damaged in the Hurricane of 1938 in Barrington, RI, Ranger was purchased by current owner’s grandfather Edward McGuire for $650. Ranger was extensively restored during the decade of the 1990’s. Continuing maintenance and upgrades since then have kept her in excellent condition. Originally powered with a Sterling Petrel 180 HP gas engine, she now has a Cummins 210 HP diesel that will push her at 14 knots, or cruise at 10 knots. She also has an Onan 5kw generator set to power her all-electric galley and hot-water heater. The main fuel tank carries 120 gallons of diesel and the auxiliary tank carries another 50 gallons. There is also an 80 gallon water tank for potable water and a 25 gallon holding tank for waste. Most of her past history has been in Massachusetts and Rhode Island waters. During the summer of 2000, Ranger participated in the Antique & Classic Boat Rendezvous at Mystic (CT) Seaport where she received a “Special Citation” award, in the Matthews Boat Owners Association (MBOA) rendezvous in Essex, CT, and in the Classic Yacht Cruise sponsored by the International Yacht Restoration School (IYRS) of Newport, RI. In the fall of 2000, she cruised from Newport to Florida over a period of 35 days. Ranger is now berthed in Cape Coral, FL and can be seen cruising the waterways of Southwest Florida and the Gulf of Mexico. 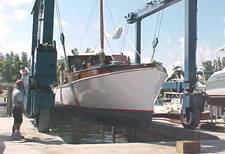 Ranger’s owners are members of the Matthews Boat Owners Association, the Antique and Classic Boat Society, Mystic Seaport Museum, and the Caloosahatchee Marching and Chowder Society. 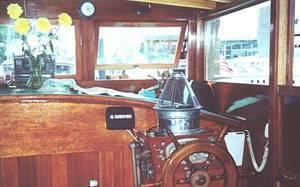 Tender To RANGER—The original 1931 Old Town Yacht Tender is carried on stern-davits. Ranger is 38’4” LOA; 11’ Beam; 3’6” Draft; 26’ Air Draft; 19,000 lb Displacement. This photo is the 2004 Haul-out that included a thorough Condition/Insurance Valuation Survey. 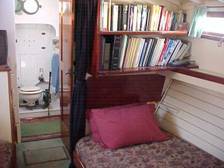 Cabin, looking forward to Head, showing double berth and library. Upper and lower twin berths, bureau, and china cabinet are to port. Note the original Wilcox-Crittenden toilet, still in use. 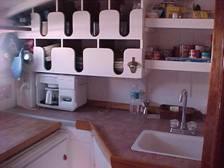 The galley includes a refrigerator/ice-maker and a 3 burner electric stove with oven. The Bridge appears nearly as original, except for GPS and VHF. The Garmin 168 Chart Plotter and Depth Sounder are concessions to modern navigational aids. The rear seat in the cockpit pulls out to make a double berth, and the cockpit may be enclosed with canvas curtains. 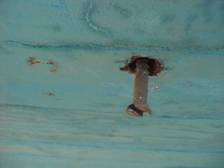 The 2004 Survey included inspection of randomly selected fastenings. All were in excellent condition.